WHEREAS countless prefer to play deaf, dumb, and blind to the menacing realities at bay (concomitantly, unfettered, the dangers accumulate exponentially), this address possesses nary any inclination, not even an iota, to pussyfoot around. Neither is there the time, let alone the patience, to play possum. Nor, monkey see, monkey do. SO, patriots, listen up: know that the end is nigh, that is, in terms of saving what is left of America – the epicenter of western civilization. This is not an exaggeration, nor is it hyperbole. Resultant, it is way past time to get with the proactive program! ALAS, herein lies the rub. Disabusing westerners of the very fact that Islam has CEASED to be a religion many moons ago, let alone, peaceful, is the MOST pressing mission of all. In light of this long overdue national disinfectant, it will become clear as day as to why mosques in America – their barracks within – must be dismantled to save the nation. A no-brainer. After all, what’s so hard to understand about that?? Incontestably, the enemy’s battle-stations within. CONVERSELY, if mosques are left intact, America will fall. And, as a knock-on effect, the west will collapse. Period. Of course, its demise won’t happen today or tomorrow, but surely within our children’s or grandchildren’s lifetime. America has never been at such a tipping point, and this is the G-d’s honest truth. TO wit, Islam must be understood for what it truly is; an all-encompassing military-political construct built upon the remnants of Mohammedism. Emphatically, military-political Islam is where the focus must be. And, this truth-telling is not up for debate, that is, if the west is to survive. Sira, p208: When God gave permission to his Apostle to fight, the second [oath of allegiance at] Aqaba contained conditions involving war which were not in the first act of fealty. Now they [Muhammad’s followers] bound themselves to war against all and sundry for God and his Apostle, while he promised them for faithful service thus the reward of paradise. The scholarly Ishaq, the author of this passage, clearly intends to impress on his Muslim readers that, while in its early years (for 14 years when in Mecca, he labored to make converts to Islam) Islam was a relatively tolerant creed that would “endure insult and forgive the ignorant,” Allah soon required Muslims “to war against all and sundry for God and his Apostle.” The Islamic calendar testifies to the importance of the Hijra by setting year one from the date of its occurrence. The year of the Hijra, 622 AD, is considered more significant than the year of Muhammad’s birth or death or that of the first Quranic revelation, because Islam is first and foremost a political-military enterprise. It was only when Muhammad left Mecca with his paramilitary band that Islam achieved its proper political-military articulation. EXTRAPOLATING further, Muhammed, Islam’s “prophet”, a madman, must be viewed without PC blinders on. Post haste. The Battle of the Trench was the third major fight, which took place in A.D. 627. The Meccans attacked with an army of 12,000 warriors, drawn from numerous tribes who were itching for payback for all the harm Muhammad had caused them. But they were unable to get beyond the trench and finally gave up after a fierce windstorm leveled their encampments.In the war part of these verses, Muhammad covers the Meccan assault on Yathrib that came to be known as the Battle of the Trench, so named because of a three-mile defensive trench he dug around vulnerable parts of the valley to fend off the attackers. By the time of this battle, he had been waging war on the Meccans for almost five years. The two major battles of Badr and Uhud had already been fought. And rewarded they were: After the invaders left, Muhammad attacked the only remaining Jewish tribe of Yathrib and ended up distributing their wealth to the faithful. When he arrived in the valley, half of its 20,000 population was Jewish, divided among three major tribes. By the time of the Battle of the Trench, Muhammad had driven out two of the Jewish tribes. Hoping to escape the same fate, the remaining tribe at first insisted on not taking sides during the Meccan attack, then agreed to aid the invaders, but then backed out of it. Muhammad used this as an excuse to behead all of the men and boys. …….continue reading, imbibing, the whole demented and dangerous truth….it gets much worse…. IN this regard, since followers of Islam are disciples of Muhammad and view him as “al-insan al-kamil” (the “ideal man”), ipso facto, is it any wonder that Mohammedans are creating a bloody swath from one end of the globe to another?? Rhetorical. AND, this is why mosques, Islam’s front-line barracks, must become GROUND ZERO for patriots, again, if the west is to survive intact – as opposed to “existing” as a “living” corpse. Thus, in March 2015, was it surprising that “The Islamization of America: A Euro-style Takeover; Patriots, What Say You?” was featured? Onto April 2016, “US Mosques & Recruitment of Terrorists, A Clear & Present Danger: Mandatory Dismantlement To Save America” jumped off these pages. STILL yet, if “doubting Thomas” types require further evidence of the same, internalize the following directives from 2 (of countless) mosque leaders in America – pointing to the absolute gravity of the situation re what Muslims are being taught within Islam’s barracks. As a matter of stone cold truth-telling (and attested to by several heavy-duty US counter terror associates), very few mosques in America are NOT teaching jihadi warfare – against Christians and Jews! Deadly serious. 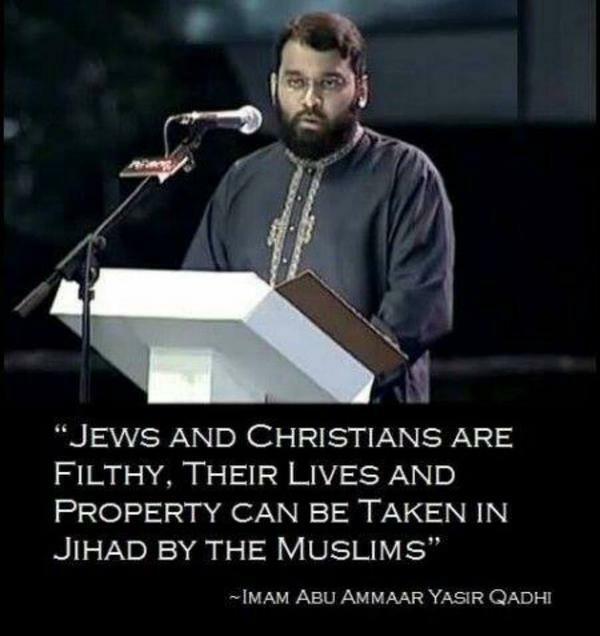 On Friday, an imam in California (yes, that left-wing tolerant west coast state in America, not some remote region of Pakistan) called for the utter annihilation of every last Jew. A video of the genocidal sermon was posted on the Davis Masjid YouTube channel and subsequently translated by watchdog organization MEMRI. According to Arutz Sheva news, Imam Shahin isn’t some illiterate hate preacher but rather a well-educated, Westernized devout Muslim who genuinely believes in the cause of Jewish genocide. Despite his background, the imam called for the kind of medieval savagery not seen since the days of the Islamic conquests of the Middle East. In fact, he cited both Islamic history and holy texts to justify his genocidal rhetoric. Oh Allah, liberate the Al-Aqsa Mosque. Oh Allah, make this happen by our hands. Let us play a part in this. Oh Allah, let us support them in words and in deeds. Oh Allah, let us support them in words and in deeds. Oh Allah, let us support them in words and in deeds. 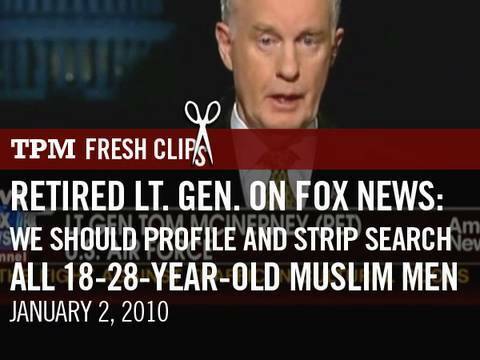 PRAY tell, too few brave-hearts exist who are willing to shout the truth from the rooftops, to be more precise, from the airwaves: “We should profile and strip search all 18-28-year-old Muslim men.” In fact, this expert takes it a step further, and expands the age range to 18-50. After all, rational folks are aware that Mohammedans (of all ages, and Muslimas alike) have done far worse to infidels – from one end of the globe to the other – than profiling and strip searching! For heaven’s sake. And, do spare this site the screams of “Islamophobia” – falling on deaf ears! BUT if patriots decide to ignore the obvious, be prepared for your children or grandchildren to do what they say – or die! 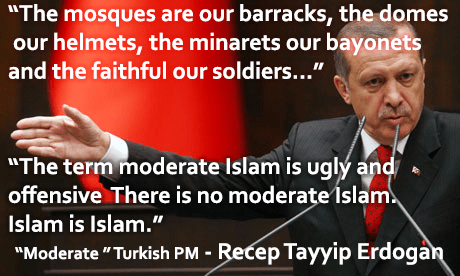 MOST revealingly, let’s give Erdogan, Turkey’s Brotherhood Mafia leader, credit for telling it like it is, even though western leaders prefer to play deaf, dumb, and blind. If anything, his words (below) are not only the truth, but meant as DIRECT marching orders to worldwide followers of Islam. AS a matter of record, Erdogan is aiming to sit astride the resurrected global Caliphate, and his recent actions in Turkey are inextricably aligned with said goal. Not only that, yours truly predicted and duly exposed (Oct. 2013) his march toward becoming the next Caliph – and then some. BUT not to be lost in this most intrinsic of all discussions, Erdogan’s truth-telling should also be taken as a warning shot to the mostly comatose west: yes, the mosques are Islam’s barracks, the domes are the helmets of Mohammedans, and the minarets are their bayonets – to be used by each and every soldier of Islam!! SHUT THEM DOWN – WITH OR WITHOUT OFFICIAL APPROVAL!! This entry was posted in Uncategorized and tagged "religion of peace", American mosques: epicenter of jihad, California's IMAM AMMAR SHAHIN, Imam Qadhi in Tennessee!, military-political Islam, THE FUNDAMENTAL PROBLEM OF ISLAM by Adina Kutnicki. Bookmark the permalink. Reblogged this on Conservative News Blog Site.